Unless you have been living under a rock the past several decades (we really hope you haven’t) you must have come across a TED talk at one point or other. The first TED took place in 1984 as a one-off conference where the topics of Technology, Entertainment and Design were merged together by the presentations of various fascinating individuals within these spheres. Gradually, TED’s popularity grew and it became an annual gathering of like-minded people. It also managed to transpass its name and include lecturers in a variety of fields – science, music, politics, philanthropy, religion and many other. TED’s success can be attributed in parts to the fact that TED organizers and speakers tend to take part out of passion and a desire to do good and make a difference. This is what makes TED talks so captivating, interesting, memorable and binge-worthy – they are a bunch of passionate inspired people who gather to tell us all about what they love. As TED has grown it has come to incorporate talks about music as well. In this article we have presented a few varied talks on the topic of music, hoping they will provide you with new knowledge and a new perspective. Robert Gupta is not only a great musician, but also a captivating storyteller. In this TED talk he retells his relationship with Nathaniel Anthony Ayers, the brilliant bassist, suffering from schizophrenia, and the power that music had in transforming his mental state. Very inspiring, albeit short lecture which illustrates the magic of music and the astounding effect it can have on people. Inspires us to think about how we can use music to help others. In this TED video Mark Ronson talks about sampling and how he sees it as a way to bring yourself and your point of view to a particular story. He also makes a perfect summary of the feelings we all have when watching a TED Talk: 1) I have done NOTHING with my life, 2) I wish these speakers could be my best friends so we can discuss all these amazing things they talk about. Mark Ronson illustrates his point by talking about the history of the song “La di da di” in the context of sampling and how it has managed to transcend generations and styles. He further enriches his presentation with his own sampling of famous TED talks about music, bringing his own perspective and narrative to their stories. Percussionist and composer Evelyn Glennie takes us on a very interesting journey into the concept of listening to music through your body. It is fascinating to listen to her describe music and its performance based on the different attitudes the musician can hold about his or herself. Glennie further talks more about music for those with disabilities, highlighting her own story of being deaf, as well as her experience of music’s transformative and medicine-like qualities. A great perspective on relying on your whole body, not only your ears, to fully comprehend and submerge yourself in sounds. Have you ever thought about what makes a piece of music beautiful? Scott Rickard explains that according to musicologist repetition is the key to whether particular music is deemed beautiful. So what he asks is – if patterns and repetitions are beauty, then what would their absence sound like? Naturally, mathematics had to get involved to solve this musical equation – a difficult journey with a surprising end result, which you can hear in the video. In a mix of performance and speaking ‘Postmodern Jukebox’ tell the story of how they got started making vintage covers of modern hit songs. A great and fascinating talk in which Scott Bradlee shares his experience with music and his thirst for transformation and creating music that people from several generations can enjoy. Joined on stage by singer Robyn Adele Anderson, they perform jazzy and swing interpretations of hit songs like “Thrift Shop”, as well as do a power ballad using as lyrics text messages of one audience member. FascinaTED? (see what we did there?) Well, grab your instrument and get together with other musicians on Drooble to make some musical magic. 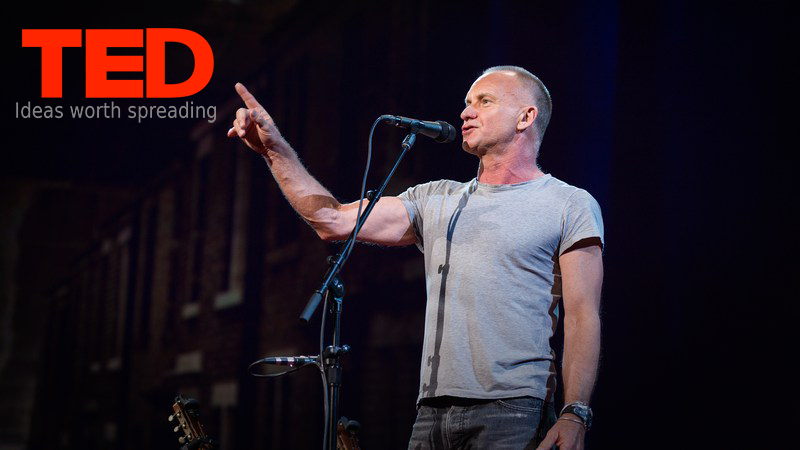 Stay tuned for more fascinated TED talks on the power, beauty, simplicity and innovation of music.